Bring back the strange apples! Varieties of apples, from left: Blue Pearmain, Tolman Sweet, and Porter. The idea of an elaborate monument to an apple—a commonplace fruit in most people’s minds—seems almost comical today, but that just shows how impoverished our concept of the apple has become. Until their fall from grace during the 20th century, apples were some of the leading protagonists in the story of American ingenuity, diversity, and prosperity. They gave the young country much of its regional flavor, and no region displayed more of that flavor than Boston. The region’s orchardists grew hundreds of varieties of apples. Each was propagated for its unique strengths, whether for booze or for baking, and each had an ardent following. With the temperance movement, Prohibition, and industrialization, all that changed. Many of the trees were cut down, while others were simply abandoned to the returning woods. By the middle of last century, the world of small-scale apple diversity succumbed to the agribusiness model of giant monoculture orchards and national supply chains. Many great apple varieties were lost in the process. But not all. Apples are very long-lived, patient beings, and New England has held onto more of its small farms than most regions of the country. Today, those old orchards and backyard trees are helping to bring some of our oldest apple exemplars back into vogue. If recent trends hold, Boston could again become the heart of a thriving apple subculture, and that Baldwin monument may not seem so odd after all. Boston’s dalliance with the apple started in 1623, when William Blaxton planted the first orchard in America on Beacon Hill. Roxbury Russet, the first American variety of apple, which probably descended from one of Blaxton’s trees, took hold on a hill above Roxbury a few years later. Apples do not come true from seed; plant a seed from a Red Delicious apple, for example, and the tree that grows will not produce Red Delicious fruit. Instead, it will produce a variety of apple never before seen, because that seed contains a unique genetic mix. If you want to produce more Red Delicious trees, you have to reproduce it asexually by taking a cutting from an existing tree. But when European colonists arrived in North America, seeds were all they had, so seeds are what they planted. Apples are not native to North America, but crab apples are, and the local pollinators welcomed the new cousins with open antennae. Thousands of trees sprang into existence, each bearing an apple new to the world. An unprecedented explosion of apple creativityensued. Most of these trees produced small, sour fruit that went straight to the pigs or the fermentation barrels, but every now and then a new star was born. Whoever was lucky enough to possess the original tree would share cuttings with neighbors, and soon a new variety would define a region. The Roxbury Russet, for example, was famous for its “keeping” qualities. Rock-hard, with sandpapery brown “russet” skin, it stays punishingly tart through September and October. Leave it in storage until midwinter, however, and it not only endures, but develops a caramelized pineapple flavor. This made it a staple in Roxbury root cellars for a couple of centuries, and the variety has been kept alive by hobbyists. It’s still a better baking apple than anything in most stores today, but any produce manager who piled Roxbury Russets in a supermarket would probably be fired, because the homely fruits no longer fit our narrow expectations of what an apple should be or do. The same goes for Boston’s other homegrown apples, which would have filled Boston greenmarkets of the mid-1800s in colorful piles. Early September was marked by the arrival of the Porter, the first great apple of the year. Canary yellow, with a winsome pink blush and delicate skin, its tender, aromatic flesh was delightful fresh and even better preserved. “Who would make jelly of any other apple, that had the Porter?” asked the abolitionist minister Henry Ward Beecher in an 1862 essay. Boston’s Fannie Farmer singled out the variety in her original 1896 cookbook, in her recipe for Canned Porter Apples. Porter’s commercial shortcomings—it bruised easily, ripened irregularly, and varied in size—were no impediment to its local clientele. Locals also knew exactly what to do with Dorchester’s Tolman Sweet, an apple whose high sugar content and tiny, dry cells allowed it to be fried to a state of golden-brown perfection that would make a Macintosh weep (literally). 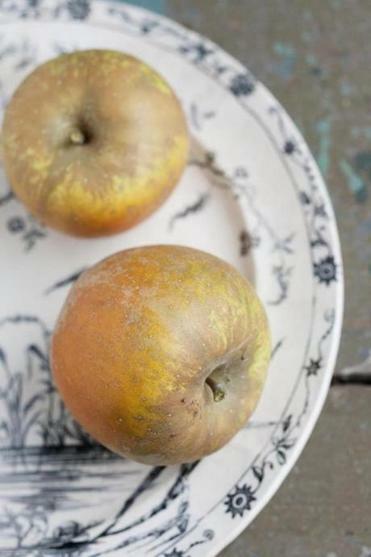 They also prized the pear-scented Blue Pearmain, a dusky purple beauty that Thoreau singled out for praise in the last essay he ever wrote, which produces baked apples worthy of display in the Fogg. By October, the 19th-century city would have been overflowing with Boston’s most famous pomological progeny, the Baldwin. 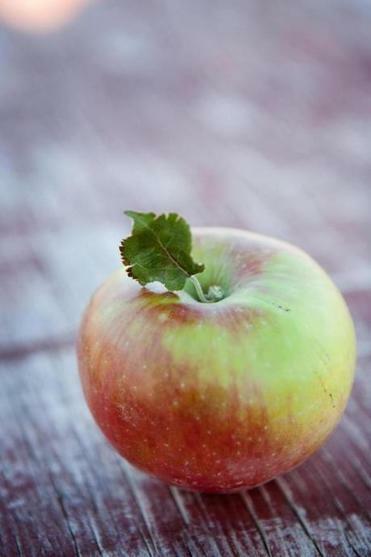 From that single wild tree found in Wilmington in the 1740s, the Baldwin had gone on to become Boston’s favorite apple by the mid-1800s, and the nation’s by 1895, when the Rumford Historical Society erected the monument to it. Boston orchards even exported thousands of barrels of Baldwins overseas. Baldwin had many strengths. Its spicy tang is still, to many people, the definitive apple flavor. It made great hard cider, then the region’s standard tipple. It was superb in crisps and crumbles, it shipped well, and, above all, it was big, red, smooth, and gorgeous. And although our ancestors knew how to appreciate ugly apples, they still carried that primal predilection for bright red fruit. This diverse garden of Eden began to wither in the 20th century, with the rise of vast industrial orchards in Washington state and the national distribution network needed to get those apples to market. In the sunny, irrigated deserts of eastern Washington, apples grew larger, sweeter, and cheaper than back east. Washington growers settled on Red Delicious, a new variety that produced bumper crops of fruit every year, with skin so thick and red, and flesh so dry, that it could withstand the shocks of storage and trucking and still look great in stores. First the family-farm orchards, with their many varieties, yielded to the convenience of the one-size-fits-all supermarket apple. Then the Northeastern commercial orchards went under as well. Baldwin’s fall came in the winter of 1934. One of many apple varieties with biennial tendencies—huge crops one year, scant ones the next—it was always ill-suited to the economics of factory farming. When a stretch of minus-40 nights killed most of the Baldwin trees in the Northeast, Red Delicious from out west quickly filled the gap in the supply chain. That wouldn’t have worked if we didn’t buy those apples, but we did. One generation removed from the farm, we’d lost our apple smarts. We consistently chose the reddest apples we could find, and supermarkets learned their lesson well. Those colorful Boston markets of the 1800s devolved into the A&Ps of the mid-1900s, slotted year-round with mealy Red Delicious and Golden Delicious, with maybe a brief stack of Macintosh each fall to break up the monotony. A few old-timers undoubtedly pined for their Baldwins, or regaled their grandkids with stories of proper pies, but the next generation simply wondered why anyone had ever enjoyed apples at all. And so we forgot. We forgot that an apple didn’t have to be red and shiny. We forgot that a good apple pie requires firm, tart apples that flaunt the “racy and wild American flavors” Thoreau prized, and that a great pie demands a mix of varieties. We forgot the luxury of sinking our teeth into a dense, rich Tolman Sweet after dinner on a cold November night. We forgot that a glass of crisp, dry hard cider on a summer day is a quintessential New England experience. Fortunately, the story doesn’t end there. If the Red Delicious generation learned to forgo apples entirely, the next one learned to define a good apple in opposition to Red Delicious. We can thank the invasion of apples from New Zealand and Australia—first Granny Smith, then Braeburn, then Gala, now Pink Lady—for shaking up the market. But it was the University of Minnesota’s trademarked Honeycrisp, with its supersweet flavor and explosive crispness, that blew it wide open in the past decade. People adored Honeycrisps so much that they gladly paid 50 percent more for them. An industry that had long banked on familiarity began wrapping its head around the value of flavor, texture, and novelty. Yet in a way Honeycrisp is just as formulaic as Red Delicious. It’s a better formula, to be sure, but now every apple released by the industry follows the same script. Like a Hollywood blockbuster, it must have lots of pyrotechnics and sugar, with only token tartness. It can’t have any quirks or challenging aspects that ask too much of the consumer. Honeycrisps are undeniably delicious, but when we expect every apple to crackle like a fruity Cheeto, we’re stymied by the ones that don’t. Handing a Roxbury Russet to a kid raised on Honeycrisps is like asking an aficionado of the Iron Man movies to chew on “Citizen Kane.” If we can expand our vision of Malus domestica to incorporate some of the masterpieces known by earlier New Englanders, we have a chance to rediscover some pre-lapsarian pleasures. That rediscovery is already under way, with Boston soon to be in the thick of it. Supremely quirky heirlooms are still growing in New England—strudel specialists, nutmeg-scented stunners, tannic cider varieties that have been out of favor since Prohibition—and are finding their way into the city, whether as fresh fruit or pressed into cider. Major supermarket chains are beginning to expand their heirloom apple programs, and Blue Pearmains and others may soon start appearing in produce sections. A group called the Boston Tree Party has planted dozens of Baldwin, Roxbury Russet, and other heirloom trees throughout the city, trees that should produce their first crop next year. Will this apple revival be a passing fad, or the door to a wild and wonderful world? That depends on us. Humanity has a long, proud history of saying yes to strange apples. The reward is always the same: knowledge.